Discussion in 'Sim Racing Hardware' started by GTPNewsWire, Aug 2, 2018. This article was published by Kyle Patrick (@SlipZtrEm) on August 2nd, 2018 in the Hardware category. PocketZeven, K32, MarcoM and 3 others like this. CTstryk, mekonrider, MarcoM and 4 others like this. Good review but my opinon remains the same on this wheel in that it’s a very poor value proposition. $800 for a wheel that’s specifically designed to work with one title on a console that costs half as much the wheel - seriously forget it. Most people who are in the market for a wheel that costs $800 to $1000 are going to be relatively serious sim enthusiasts who are running a multitude of other sims alongside GTS, in which case there are far better options out there for similar money. It may well be the best wheel for GTS, but at $800 it need to be a damned good wheel for everything else as well, and when it basically reverts to being a slightly more pokey T300 when not used with GTS then it’s really very bad value for money. Disclosure - I’ve not used the wheel, so consider the above my reasons for not buying the wheel - I have the cash and could get one tomorrow, but nothing I’ve read about this wheel convinces me that it’s even close to being worth the money. Oh, and then there’s Thrustmaster’s legendary reliability to consider as well - if you know what I mean. CTstryk, mekonrider, letsdothis97 and 4 others like this. The price tag is insane. I like the wheel design i am sure its a good piece, but no review i read or watched so far was 100% positive. Honestly, this is what i would expect from a wheel this expensive. Still, im sure those who bought it are happy people. I stick with the G29 for the time being... it offers a lot of fun for a low price and thanks to Drivehub, i can use it on both Xbox and PS4. mekonrider, VBR and Slapped like this. MarcoM and VBR like this. Not worth the price imho. mekonrider and VBR like this. I hate the silver part. It is painted right? It should be all black. mekonrider, Brzlav and VBR like this. Quite a balanced in-depth review right there bro. Don't think anyone can accuse you of being biased with that. Rotorist, VBR and Gr8_Lakes like this. I didn't mention it in the article, but from my understanding the external turbo-shaped power supply largely fixes the main issue with T300 reliability. Article updated to reflect that, thanks! Rotorist, MarcoM, Slapped and 1 other person like this. I currently use a T500RS and enjoy it, the FFB feels good in GT Sport, but I also haven't used any other wheels for comparison. I wonder what kind of upgrade the T-GT would be over my current wheel if it took a dump? The biggest criticism that I read about the T-GT are the pedals, but the T500RS pedals work well and can use them with the T-GT if necessary. Just kind of curious to try a T-GT at some point to see if I feel a huge difference, and I agree that at $800 it's pricey, but when you see them at 50% off, the T-GT does get a lot more interesting to me. marcvic and VBR like this. "but know that currently, it’s a Gran Turismo exclusive. It’s a very cool bit of kit, so it’s a shame Polyphony and Thrustmaster won’t open it up to other developers." I have let myself understand T-DFB is combatible with Crew 2.. I am pretty happy with the wheel after few months of use. One must know I paid 350e for it though..
Rotorist and VBR like this. I still have my T500RS on one of my older rigs, but I find it very hard to go back to now that I'm used to the T-GT. For GT Sport, it is a significant upgrade and worth it if you can afford it. If you like the T500RS pedals, you'll like the T-GT's — they're basically the same thing with different pedal plates. Zero7159 and SpecMiata-JSW like this. If they've addressed the reliability issue then that's great and not before time, but the rest of my post still stands in that IMO the wheel is too damned expensive for what it delivers outside of the GTS ecosystem. 800 euro for old dual belt drive plastic mechanism with 40 watts "powerful" motor, sorry but no. CTstryk, Whitestar and wajdi1977 like this. Hey @Jordan , great to hear from you again, and thanks for the feedback! Now you've got me thinking about how much I can sell my trusty T500RS for to offset the cost of a new wheel? My largest complaint about the T500RS was the size of the wheel, I always felt it was too big and the size added to increased input when driving, almost like driving a car with a slower steering rack. I wonder if I was on to something with my wheel size logic seeing how Thrustmaster shrunk the size of the rim on the T-GT? More than likely I'll let my T500RS die of old age, then I'll figure out what to upgrade too.....unless more of those big sales on the T-GT come around again. SlipZtrEm, PzR Slim and Jordan like this. davidt33 and marcvic like this. Now, I said in another thread, the Wheel is no where close to being worth the $800 price tag. It was just on sale for $449 and even at that price it's over priced. So there is no way, you are paying a $400 premium just because of that..
Good review!! I love mine worth every penny!! I don't know about the US prices but T-GT was €650 while the CSL Elite with the 3-pedal set was €850 on Amazon.de. So i went for T-GT after i had issues with my T300RS GT. "Project CARS 2 fairs less well, though I chalk that up to my existing in-game FFB settings. There’s no feedback when the tires lose grip, and the wheel does an odd sawing motion at the exit of most corners." That odd sawing motion is present with my good old G25 as well. I think it is just how PC2 is programmed. I don't like that. Feels artificial. Looks like a great wheel, wouldn't mind testing it out somewhere in 2019. Question: Would the stock CSL Elite Pedals go with the T-GT? I have the normal CSL Elite wheel and pedals, and looking at this review, it seems that the pedals are letting the T-GT down, so I'm thinking of doing a Fanatec/TM combo for the best results. EDIT: The only thing I would propose for the review is a comparison to its' closest rival from Fanatec (CSL Elite), since there are many people that might be scratching their heads when deciding what's best. Anyone got any thoughts for which wheel is better for GTS right now? super_gt and K32 like this. That's a big shame. Such a setup would be very hard to beat in the right hands. Still, I hope I get pleasantly surprised when I get my hands on the T-GT (despite the meh pedals). As someone that's really only just got into sim racing since the release of GT Sport, this to me seems like a good move. pedals I'm not too fussed about if they work they work,but overall this looks good quality and i know i would definitely get my use out of it. so to be honest I'm saving for this baby lol people seem happy with it. my only fear is the learning curve from pad to wheel would be a setback but I can imagine this wheel would eventually make you better if not more precise/safer on the track? this wheel would eventually make you better if not more precise/safer on the track? In general, a wheel helps with consistency even though in GTS there are crazy fast and consistent DS4 drivers. I'm not sure a T-GT would make you significantly faster than a T150. I'd argue that it is so much more down to your overall skill level that any improvement by this wheel vs a cheaper one will be almost immeasurable. People say a high end pedal set makes you faster, but as long as you are driving GTS with ABS on default as most people do, there won't be a difference. The new patch seems to have improved braking which could make a load cell pedal feasible but I haven't tried it yet. To be honest, if money is an issue (I guess it is for you as you need to save for it), as a GTS only player I'd go for a T150 with T3PA Pedals. Jeeez, the Fanatec Podium DD1 (for PC and Xbox One) is 840 without VAT. That puts TM's pricing into perspective. 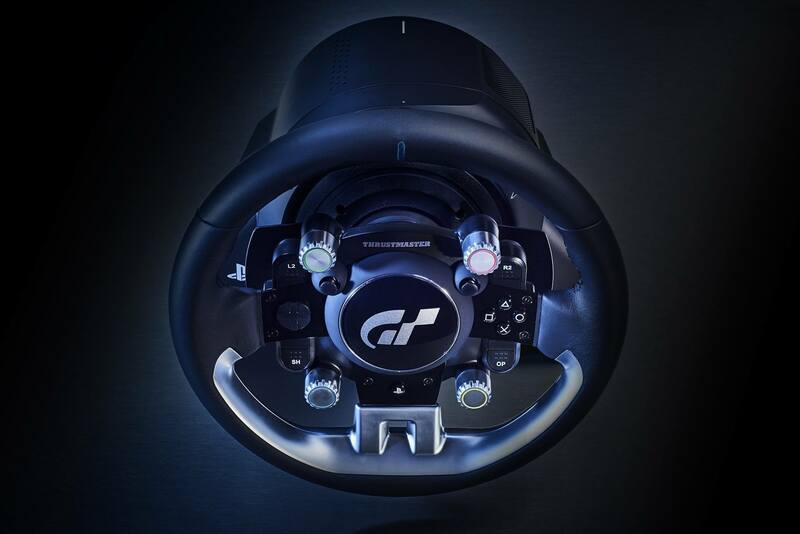 If I were considering this wheel (which I'm not) then I would definitely wait to see how Fanatec prices the Podium Racing Wheel (for PS4). Maybe in your country, but not in mine. While I consider the Podium series will be a great product and I may look to go that way in the future, atm it's far more expensive, just the (PC and Xbox One) base is $1600 AUD with no pedals, wheel or extended warranty. It could easily run twice the price of the T-GT ($1200 AUD at full price) with the complete kit.